Flying time helps keep budgies healthy and happy. Also called parakeets and budgerigars, budgies are bright, curious and sociable birds, and they enjoy time spent outside their cages in safe environments where they can exercise and explore. Trained budgies leave and return to their cages when directed by their owners, but untrained birds can be difficult to catch. Budgies need exercise and socialization time to stay healthy. Birds who never leave their cages become overweight and develop illnesses such as fatty liver disease and tumors. Budgies live in flocks in the wild, so they also need to spend time with their caregivers and other birds. Let trained budgies out of their cages into a safe room every day and allow them to fly around for an hour or so. Untrained birds also require time outside their cages but you may want to have their wings clipped for safety. 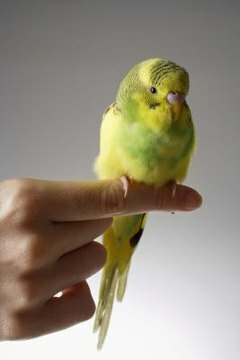 Veterinary surgeons can clip budgies' wings. Homes contain many hazards for budgies outside their cages. As well as closing all doors and windows, and turning off ceiling fans and stoves, mirrors should be turned to the wall or covered. Open pots of hot food and liquid, and open fires, are also dangerous. Budgies are curious birds and may disappear while investigating an interesting corner. Scheduling budgies' exercise periods to regular times each day can help prevent leaving a door open while budgies are out of sight. As well as flying, budgies can climb, forage, shred materials and play for exercise while outside or in their cages. Encourage birds to climb budgie ladders by holding a small treat at the top, and slowly turn the ladder so the birds must reverse direction and climb again. Foraging for pellets mixed into a shallow tray of pebbles or marbles, and retrieving vegetables twisted around cage bars, also provide exercise and interest for budgies. Newspaper, strips of rawhide and washed eucalyptus or willow branches entice budgies to spend hours shredding. Specialized budgie toys are another good source of exercise, but rotate the toys so that there's something different to play with every three or four days. Budgie cages should provide enough room for exercise while birds are confined. Budgies usually spend most of their lives in cages, so buy the largest you can afford. Wide, shallow cages are better than tall, narrow ones because budgies fly horizontally, not up and down. Fix perches high up on the cage walls at both ends of the cage, while still allowing enough room for budgies to perch. This encourages birds to fly between them.